On behalf of the Narre Warren Football & Netball Club we would like to welcome you to our club. As a club we had a very successful 2018 with all Senior Netball & Football teams making the Finals & with the B Grade Netball team achieving the ultimate success. 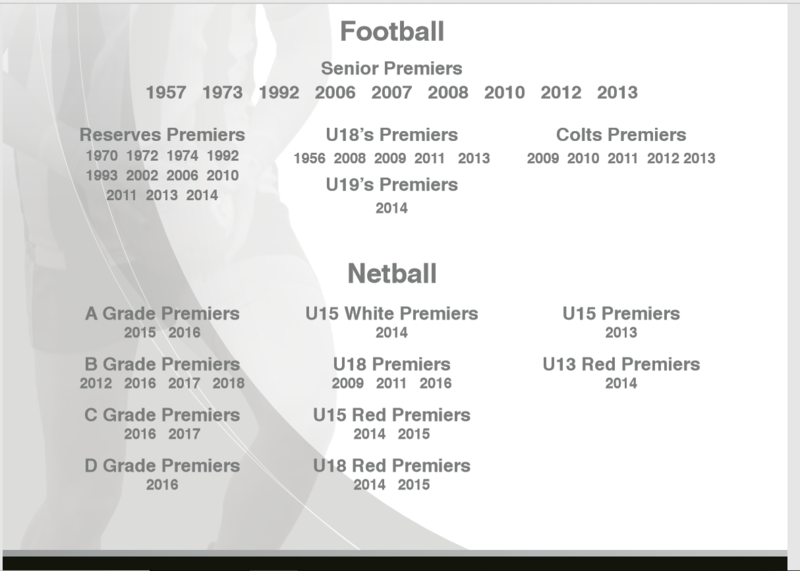 Our future looks bright with both of our under 17’s Netball and Under 19’s Football teams also making Finals. As we look forward to the 2019 season there is great excitement within in our club as we move into the Premier Division of the AFL Outer East Football & Netball Competition. Our first home is on Saturday the 27th of April v Beaconsfield where we also celebrate our Past Players Day & also conduct an ANZAC weekend ceremony. All former players , committee people , supporters , their families and all former and current servicemen & service women are welcome to join us on this day . we are excited that our own highly regarded coach, Michelle Mashado will take the reigns as our A Grade Netball Coaches. The building of the new social rooms is completed and we can start to enjoy the full benefit of them . All club members are welcome to join us in the rooms at all home games. can help to showcase those local businesses who support our club. & Phil Cipriani to ensure our club sponsors are looked after and your business benefits from supporting the club. Darren or Phil will be in touch soon and we are hopeful you will choose to continue to support our club in 2019.